The family of a Springfield man who was shot and killed by police officers during a stand-off last year has filed a $12 million wrongful death lawsuit. Fairfax County Police were dispatched to the 7900 block of Pebble Brook Court on the afternoon of Aug. 30, 2013 for a domestic disturbance and a possibly armed individual. In amateur video from the scene obtained exclusively by News4, the suspect is seen at the front door of his home while officers, K-9 units and SWAT team members surround the area. The man, identified as 46-year-old John Geer, negotiated with police for about 40 minutes before a patrol officer fired a single shot into the home and struck Geer, who then barricaded himself inside the home. In order to help him, the home's front door was knocked in by a police tanker, and SWAT team members made their way inside after 40 minutes of waiting, according to the suit. Officials later confirmed the gunshot fired by police earlier in the afternoon had killed Geer. Investigators later learned Geer didn't have any weapons. The lawsuit claims in the 40 minutes it took officers to check on Geer after shooting him, he bled to death. 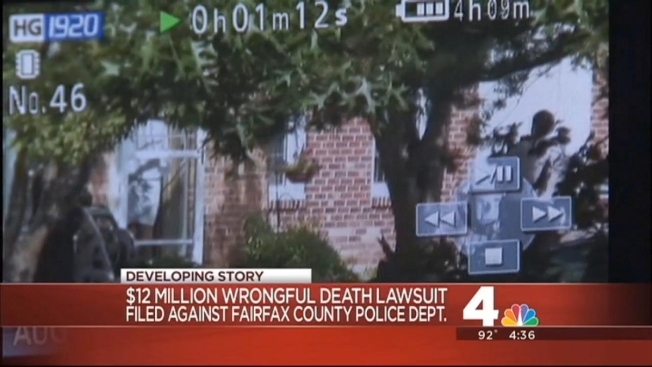 The Fairfax County police chief and three responding officers are named in the suit.